With UCLA wrapping up the Pac-10 regular season conference championship last week, attention turned yesterday to individual honors in the conference with Bruin players dominating in all categories. 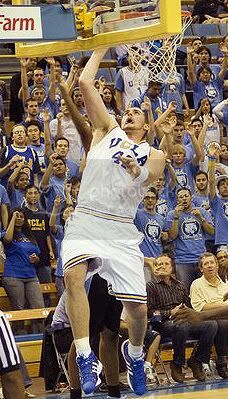 Freshman center Kevin Love was selected Pac-10 Conference Player of the Year. It is the seventh time a Bruin has captured the award. Arron Afflalo won the award last season, Ed O'Bannon in 1995, Kenny Fields in 1983, David Greenwood in 1978 and 1979 and Marques Johnson in 1977. "I didn’t think they’d give it to a freshman," Love said. "There are a lot of great players in the league but I was very shocked. I knew I was in contention, but a lot of people don’t like UCLA, if you can believe that." Love is only the second freshman in league history to win the award. The other freshman was California's Shareef Abdur-Rahim in 1996. Not surprisingly, Love was also named Pac-10 Freshman of the Year. He is the third Bruin in the last four years to win the Freshman of the Year Award. Luc Richard Mbah a Moute won it in 2006 and Jordan Farmar earned it in 2005. Other Bruins to capture the award include Jason Kapono (co-winner) in 2000, Baron Davis in 1998, Don MacLean in 1989 and Pooh Richardson (co-winner) in 1986. "It means a lot, especially since we won the Pac-10," Love said. "If we would have lost it, then it wouldn’t have been as big of a deal to me. Since we won, I’ll take it." Sophomore guard Russell Westbrook was named the Pac-10 Defensive Player of the Year and named to the All-Defensive team. Backcourt mate junior Darren Collison was also named to the All-Defensive team. "I worked hard," Westbrook said. "I tried to lock up the other team’s best player, and I won the award." Love and Luc Richard Mbah a Moute were All-Defensive honorable mention. "I think defense is a part of this league now, more so than 10 years ago. To have an all-defensive team, I think, is great," UCLA Coach Ben Howland said. Luc was honorable mention all-defensive team and I thought he should have been on the all-defensive team first team. I just think he’s taken for granted too much." Kevin Love was named to the All-Pac-10 first team. Darren Collison was named second-team All-Pac-10, and Westbrook was named third-team All-Pac-10. Juniors Luc Richard Mbah a Moute and Josh Shipp earned All-Pac-10 honorable mentions. "My only disappointment in this was that I thought Darren Collison definitely deserved to be on the first team," Howland said. "That was a little frustrating for me. When you look at his numbers, he’s No. 1 in free-throw percentage, No. 1 in steals, No. 2 in assists; he’s shooting 53% from 3 [-point range], which I think is second; he’s averaging 15.4 points a game, which is ninth; he’s on the all-defensive team so the coaches do recognize what a great defender he is. And when you win the league by three games and you’re the starting point guard, I really believe he deserved to be first team." Honorable Mention (also receiving votes): Aron Baynes (Washington St., Jr., C), Patrick Christopher (California, So., G/F), Anthony Goods (Stanford, Jr., G), Malik Hairston (Oregon, Sr., G), Jordan Hill (Arizona, So., F), Davon Jefferson (USC, Fr., F), Mitch Johnson (Stanford, Jr., G), Robin Lopez (Stanford, So., C), Luc Richard Mbah a Moute (UCLA, Jr., F), Josh Shipp (UCLA, Jr. F). Honorable Mention (also receiving votes): Jon Brockman (Washington, Jr., F), Robbie Cowgill (Washington St., Sr., F), Jordan Hill (Arizona, So., F), Brook Lopez (Stanford, So., F), Kevin Love (UCLA, Fr., C), O.J. Mayo (USC, Fr., G), Luc Richard Mbah a Moute (UCLA, Jr., F), Jawann McClellan (Arizona, Sr., G), Fred Washington (Stanford, Sr., G). Stanford Head Coach Trent Johnson was named Pac-10 Coach of the Year. Coach of the Year, All-Conference, All-Freshman, and All-Defensive teams are voted on by the coaches. Coaches are not permitted to vote for themselves or their own players for the honors. I completely agree with Howland, Collison should have absolutely been on the first team. Did Cal and Stanford's coaches not see Collison WILL us the win in those games? I don't think Anderson and Harden belong on the first team. They're amazing players, but look at how their teams did in the conference. Give DC some credit and congratulations to all the other Bruins mentioned above! I think Trent Johnson deserved his honor. Collison should have been first team. Love gets an honorable mention for defense?? ?